The market in Hemel Hempstead has been an important element in the history of the town. 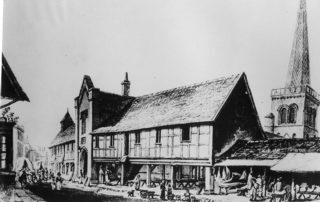 Many markets and fairs were already flourishing before the earliest records mention them, but the date of the charter for Hemel Hempstead’s market is well-known. Henry VIII granted a Charter of Incorporation to Hemel Hempstead on 29 December 1539. 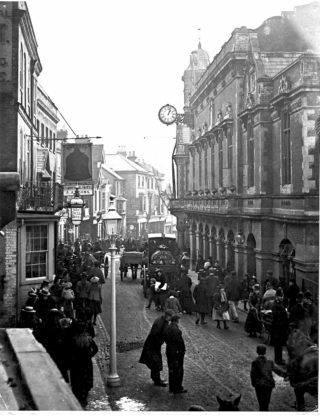 (Local people used the markets of Berkhamsted or St Albans before then.) The charter gave them a weekly Thursday market of their own, together with the right to hold a ‘Court of Piepowder’. This was a corruption of the French ‘Pieds Poudres’, meaning ‘dusty feet’, at which any visiting traders could be tried and punished, or disputes settled, before the dust of the town was off their feet. The names of the Jury for 1653 included Richard Combe, Richard Salter, Francis, John and Daniel How and Nicholas Stratford. The market bell, which still exists, was rung at eleven o’clock in the morning on market days. The Charter also allowed the annual election on St Andrew’s day of a Bailiff to administer the court and the market. The very first Bailiff, William Stephyns, was nominated by the King. The Bailiwick possessed its own set of weights and measures and the Underbailiff had to attend the market to check the butchers’ scales. There was a cage for transgressors and a pound for stray cattle. The market brought prosperity to this mainly agricultural area, as Daniel Defoe noted in his A Tour through England in 1724: “The town of Hempstead, noted for its extraordinary corn market”. The nearby corn mills along the Gade and Bulbourne rivers helped towards the town’s rising status. An annual fair was an important addition to the charter and the Court of Piepowder was also in session on fair days. By the end of the 18th century, the market had enlarged to such an extent that it was running for several days a week. There were special markets for corn, wool, cattle, general produce and, later on, straw plait. At first they were held in the street which became known as ‘Market Street’. Gradually room was found in the fields to the east of the town for special markets. The properties by the roadside were developed in every direction, including encroachment on to the roadway, until the present width was reached. 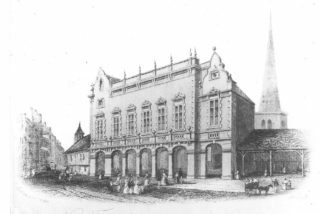 The earliest stage was the replacement of the open portion by the arched section of today’s ‘Old Town Hall’ in 1851. 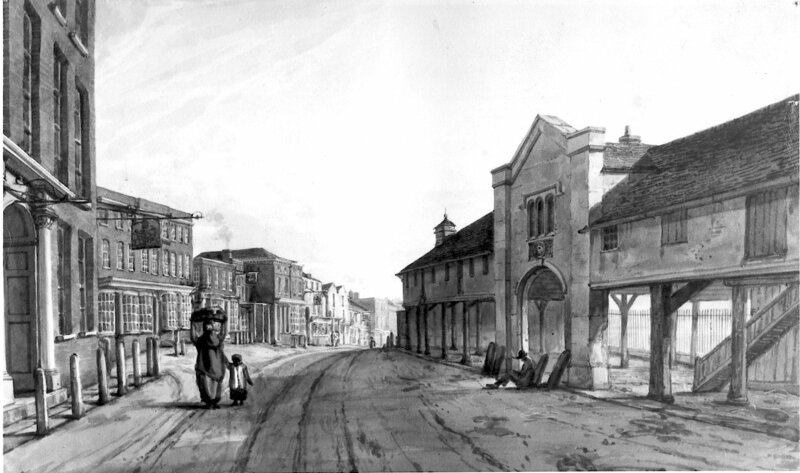 Further developments took place towards the north in 1857 and 1861, with the addition of a Reading Room and a Vestry. Contributions to this project were made from the Box Moor Trust Surplus. Apart from administering the market, the Bailiff gradually assumed other powers. When the inhabitants applied to become a Borough, the Charter of Queen Victoria in 1898 allowed the chief citizen of Hemel Hempstead to be called ‘Mayor and Bailiff’. This title was extinguished with the formation of Dacorum District Council on 31 March 1974, until the title of Mayor was reinstated for Dacorum Borough Council. Today the ‘Old Town Hall’ building serves as an Arts’ Centre. The arched market area occasionally serves its original purpose. After the construction of the New Town in the 1950s, the market was re-sited in the square in Marlowes. Whilst the need for the corn, wool and cattle markets has long since vanished, the general market still flourishes in its new home in the pedestrianised area of Marlowes. nothing about one of the most important churches which has been there a thousand years ?